There are several people by the name Robert Johnson: 1) A U.S. blues guitarist, singer, and composer (1911-1938). 2) An English lutenist and composer (c.1580-c.1634). 3) A U.S. rock musician. 1) Robert Johnson (1911-1938) was a U.S. blues singer, guitarist, and songwriter, among the most famous of Delta blues musicians. His landmark recordings from 1936 to 1937 display a remarkable combination of singing, guitar skills, and songwriting talent that have influenced generations of musicians. 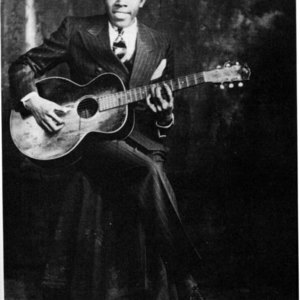 1) A U.S. blues guitarist, singer, and composer (1911-1938). 2) An English lutenist and composer (c.1580-c.1634). 3) A U.S. rock musician. 1) Robert Johnson (1911-1938) was a U.S. blues singer, guitarist, and songwriter, among the most famous of Delta blues musicians. His landmark recordings from 1936 to 1937 display a remarkable combination of singing, guitar skills, and songwriting talent that have influenced generations of musicians. Johnson's shadowy, poorly documented life, and death at the age of twenty-seven have given rise to much legend. The most widely known legend surrounding Robert Johnson says that he sold his soul to the devil at the crossroads of U.S. Highway 61 and U.S. Highway 49 in Clarksdale, Mississippi, in exchange for prowess in playing the guitar. Actually, the location Johnson made reference to is a short distance away from that intersection. The legend was told mainly by Son House, but finds no corroboration in any of Johnson's work, despite titles like "Me and the Devil Blues" and "Hellhound On My Trail". This said, the song "Cross Road Blues" is both widely and loosely interpreted by many as a descriptive encounter of Johnson selling his soul. The older Tommy Johnson (probably no relation, although it is speculated that they were cousins), by contrast, also claimed to have sold his soul to the devil. The story was that if someone went to the crossroads a little before midnight and began to play the guitar, a large black man would come up to him, retune his guitar, and hand it back. At this point (so the legend goes) the guitarist had sold his soul to become a virtuoso (a similar legend even surrounded virtuoso violinist Niccol&ograve; Paganini a century before). His death remains a matter of controversy. Some accounts state that he was given poisoned whisky at a dance by the husband of a woman he had been secretly seeing. Others claim that it was just the devil collecting his debt. However, the latest, less dramatic, and more plausible theory (published by David Connell in the British Medical Journal) is that Robert Johnson suffered from Marfan's Syndrome. Marfan's is a genetic disorder characterized by disproportionately long limbs, long thin fingers, and a tall stature - all of which can be seen in the two photos of Johnson that survive. Marfan's Syndrome is a cause of heart defects, and a complication such as an aortic dissection could lead to Johnson's excruciatingly painful death. 2) Robert Johnson (c.1580-c.1634) was an English lutenist and composer of the late Tudor and early Jacobean eras. He was the son of John Johnson. 3) Memphis-based Robert Johnson has been recording since the early 1970s. Some early appearances were on recordings by The Hot Dogs, a band that featured Jack Holder and Greg Reding, later to cross the Mississippi River and become members of the raunchy hard-rocking Black Oak Arkansas. By the late 1970s, Johnson had recorded a single with The Bell Heirs and had established a somewhat regular playing relationship with a rhythm section featuring bassist Dave Cochran and drummer Blair Cunningham. The Infinity label released the premier Johnson effort as a leader, an album entitled Close Personal Friend, yet a collection entitled The Memphis Demos, which came out the following year, is considered to be a much better representation of his work, not the first time a musician's more casual performances beat out a supposedly more serious album project.